Read on to discover who Robyn Bresnahan is giggling beside. Hint: His football club is the top story in Euro sports circles today. Ottawa Magazine’s Telling Tales columnist, Michael Prentice, interviewed CBC Ottawa Morning host Robyn Bresnahan for the May edition. He recorded the full conversation for this web post. Aside from the job, what do you like about Ottawa so far? Reconnecting with old friends, winter walks in the Arboretum, lobsterghetti at the Whalesbone, taking myself on afternoon dates to the National Gallery, runs along the canal, pulled pork sandwiches at Pressed Cafe, lazy Sundays at home reading the New York Times. Waking up at 3.30 a.m. five days a week makes me a little loco. I regularly walk into windows, put shampoo on my toothbrush, and attempt to pay for things with my bus pass. In what part of town do you live? It’s an area called Glebe Annex. No one knows where it is. I’ve actually renamed it West Glebe. It sounds very posh that way. Do you have a significant other, and, if so, who is it? Hmmmm. He’s made me promise not to talk about him on air. But this isn’t the radio, so I’ll reveal his name. It’s Harry. He’s a hunk of burning love and I’m one lucky lass. What is your routine on work days, including do you have an alarm clock, and what time do you awake? The alarm goes off at 3.30 a.m. I groan.Harry groans. The cat groans. Stumble out of bed. Walk into the closet to have a shower. Discover it’s not really the shower. Taxi comes at 4 a.m. Listen to news en route to work. Watch BBC World, The National, read papers, tweak scripts, on air at 5.30 a.m. Off air 8.37 a.m. Gym. Back to work, pre-record an interview for next day. Leave by noon. Take a nap. Wake up, stumble into Glebe or Little Italy for coffee. Read more papers. Cook dinner. Look over scripts for next day. Lights out by 9.30 p.m. Cooking, eating out, red wine, hiking, reading the New Yorker, Ottawa Magazine, and watching Manchester United lose. What do you have against England’s most successful football team [Ed: soccer to you]? I can’t explain it. They’re just so smug. And that gum-chewing Alex Ferguson (Man. U.’s coach) drives me bananas. Since you follow English soccer, who’s your favourite team? I’m a massive Chelsea supporter. 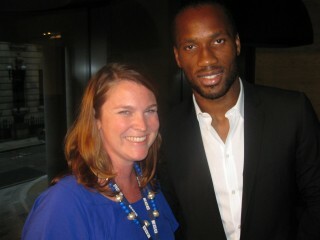 Didier Drogba (Chelsea’s heartthrob centreforward from the Ivory Coast) is my fave. I even got to interview him once. I have a picture to prove it! Cooking is my yoga. Cooking, plus a lovely gin and tonic, plus BBC 6 music on the radio equals my happy place.